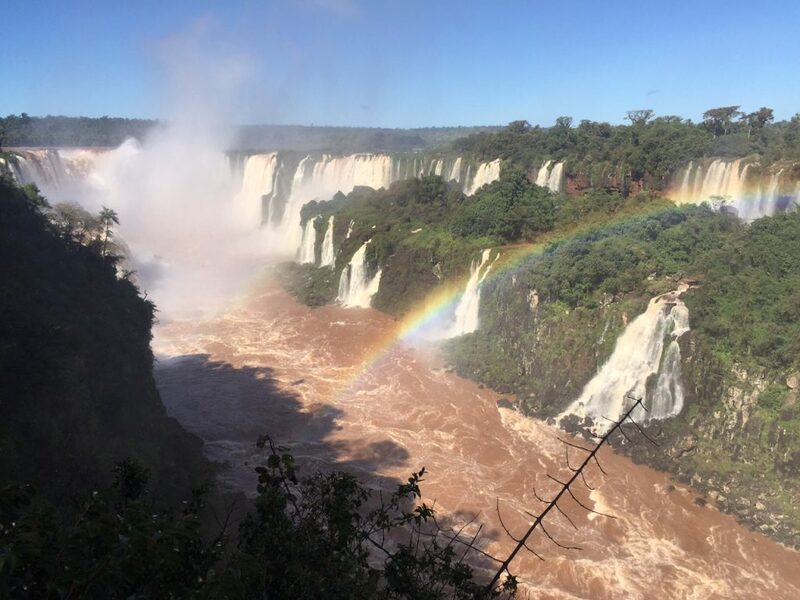 Iguazu Falls are a series of waterfalls at the junction of the Brazilian, Argentinian and Paraguayan borders. 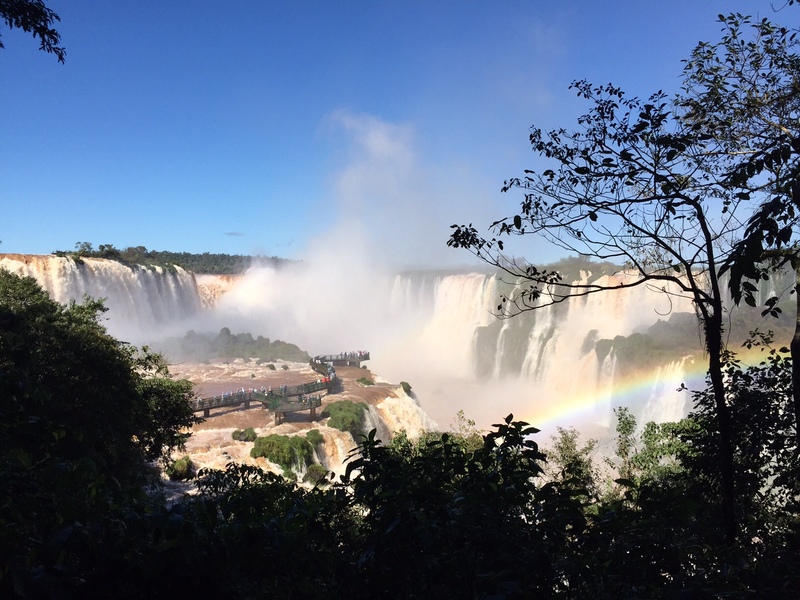 The falls are a new world wonder and a UNESCO World Heritage Site so breathtaking views were almost guaranteed, but these are five things I was not expecting. 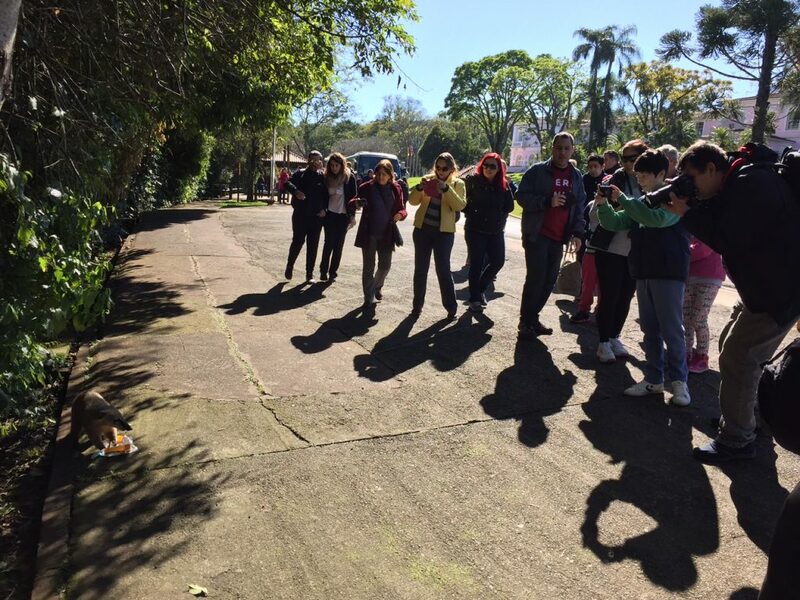 The boardwalk in the centre of Iguazu Falls is known as ‘Devil’s Throat’. 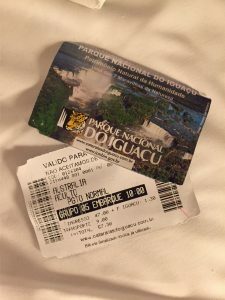 I hadn’t done much research on Foz Do Iguacu, but I think Dan put it best, he expected it to be somewhat like Yulara in Australia, a small area of hotels and not much else. But as we flew in over the city and could see all the twinkling lights it was clear that this was not just a little tourist hub. We didn’t have too much time to explore but we could see that there were lots of things to do. Our favourite was going to Buffalo Branco, a Churrascaria, an all-you-can-eat Brazilian barbecue where the meat is served on swords! Entertaining and delicious! 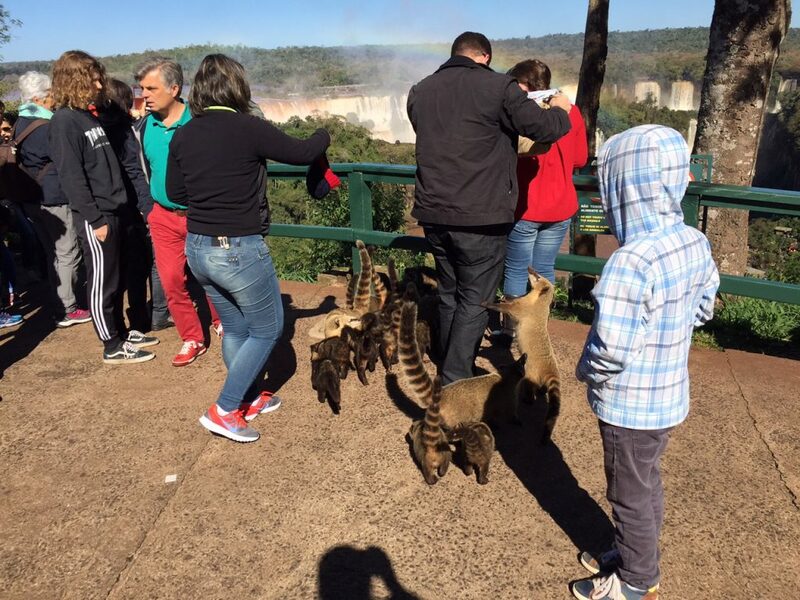 I had never heard of quatis before (coatis in English), which are in the same animal family as raccoons. No one had mentioned them in the previous 2 weeks we had been in Brazil. But the first thing I saw as we got off the bus at the falls was a sign warning not to touch or feed them with a large graphic photo of a bite wound. So I proceeded with caution when we saw our first one nearby nibbling on some chips. It didn’t look dangerous. In fact, it was fluffy and kind of cute. Everyone crowded around to get a photo, including me, and after I had got the shot we started the walk down to the falls. It should have been the falls that demanded 100% of my attention as we approached the first lookout, but instead it was the masses of quatis! And they weren’t shy! Anything left on the ground had a quati in it. If you had food in your hand, trust me, a quati would get it. No one was looking at them as cute fluffy animals anymore. Everyone was trying to shed any food they were carrying before they had a quati climbing up their leg! This family had quatis all over them after they let their guard down for a brief moment and put a bag on the ground. If you bring food to falls, make sure it is well packaged and kept up high. Even eat while standing because otherwise your lunch will belong to the quati and you may have to get a rabies shot! Ok well this was not the biggest surprise but it was more than we were expecting. Entry to the park is about $57R per person (about $25 AUD). There is also a small variation in the price depending on what country you are from. But entry only permits you to walk the main trail along the falls. If you want to take a boat ride either above or below the falls or walk the trails to get to these places, it costs serious money. The boat ride was about $200R per person (about $80 AUD). While these are once in a lifetime adventures, if you are travelling long term or on a tight budget then there are only so many ‘once in a lifetime’ things you can afford, and for us, this wasn’t one of them. Just base level tickets for us! You will get very wet! We got drenched! It’s not avoidable. Even if it is a sunny day it will make no difference. The power of the water crashing onto the rocks below results in a thick mist of water droplets in the air and the closer to the falls you get, the thicker the mist. By the time you reach the end of the trail at Devil’s Throat it will be impossible not to be soaked. I was fortunate enough to have brought my rain jacket. Dan was not, and was completely soaked through by the end! 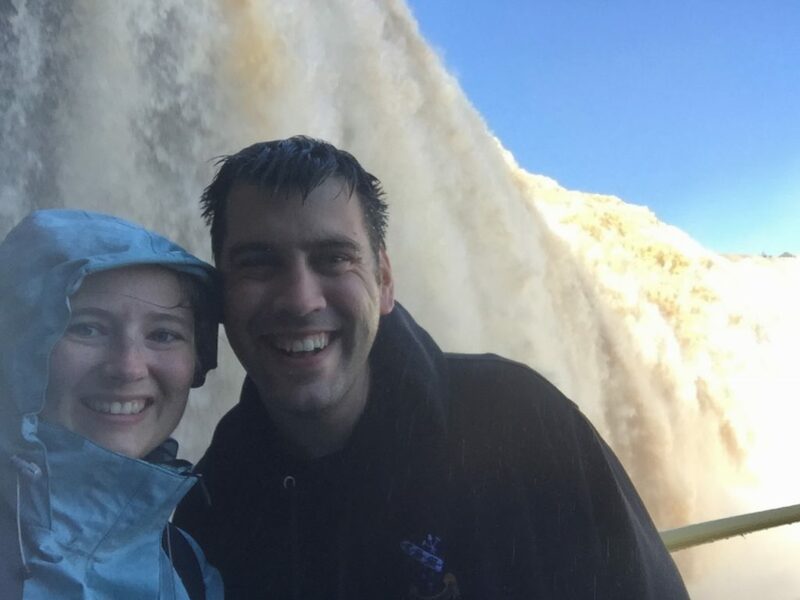 I recommend not wearing jeans and bringing your own rain gear, but if you forget you can purchase ponchos and towels at the entrance to Devil’s Throat, albeit at an inflated price. It is worth every Quati, Dollar and Drop of Water! When you get to the end of the trail and see the water flowing over the sheer drops in every direction, you instantly forget that you are being drenched, or that your wallet is empty or that your lunch was eaten by a Quati. Instead you see the many rainbows forming in the mist and the waves of water turn from brown to white as they crash against the rocks. It is a surreal place that reminds you of the power and the beauty of mother nature. It truly is a place that everyone should see in their lifetime and I am so grateful that I was fortunate enough to go! What a view! The rainbows make it even more magical!